Go on any gaming forum and you will be able to find countless posts cursing video game developers for “ruining their immersion.” Hell, Cracked.com even has an article raging about it. “Why can’t I shatter this window and go in that pointless room?” cries one. “I bounced off an invisible wall!” complains another. While the little barriers remind us that we are inside a video game and following its oddly defined rules are certainly frustrating, the people who complain incessantly about them seem to be forgetting the very purpose of their existence; video games are designed to entertain, and these perceived faults in immersion serve to fulfill that purpose of entertaining the player. While these elements are not in and of themselves fun, they preserve the entertainment value of the game by keeping the game scenic, preventing a scenario that would be incredibly frustrating to players of all genres, and improving overall immersion. So sit back for a moment and try to keep your head cool while we explore just how these little annoyances are actually a good thing. Our first example comes from the world of snowboarding games. You’re soaring through the air after a jump and trying to pull off that sick move or combo. Victory is close at hand, then all of a sudden, your avatar is abruptly bounced off an invisible wall and falls tumbling to the ground. Why? Because you left the designated course the game wanted you to stay within. Controllers are thrown, curse words are spoken, and you scratch your head wondering why the developers couldn’t just put a cliff there or something. Invisible walls are not limited to sports games. I’m pretty sure they sent my little purple dragon friend, Spyro, crashing down many a time when I played as a child. The invisible wall is the sandbox player’s mortal enemy; the player feels as though they have infinite space in which to roam and stomp on smaller creatures for coins only to be suddenly reminded that they are, in fact, trapped within a limited space when they inadvertently wander into an impenetrable force-field of nothingness. This obstacle can be so frustrating to players that there are countless YouTube videos dedicated to “getting behind the invisible wall” in hundreds of games. Despite there being nothing on the other side beyond a glitchy nothing world, people continue to try to get past these invisible walls for nothing more than the reward of beating the system. The fact that players are willing to go through all this trouble begs the question of why game developers use invisible walls at all. To understand this, we must go back to our example of the snowboarding game. As we twist and turn in the air, doing tricks that would make Shaun White jealous, we see a vast blue sky interrupted only by the jagged peaks of countless snowy mountains. Ski lifts, trees and lodges dot the landscape as other riders carve the fresh powder in this picturesque virtual world. Now, imagine all that was covered up by two insurmountably tall cliffs on either side of you. The only scenery you can enjoy is what is directly in front of you along your path or behind you where you came from because everything else is blocked out by two cold, unforgiving, solid white walls that stretch up into the heavens. Now those invisible walls that occasionally made your gaming experience unrealistic have been replaced by visible walls that make your gaming experience both unrealistic and ugly. Video games are all about creating an illusion, making the impossible seem possible. Why, then, are they not permitted to create the illusion of infinite space? Invisible walls serve to preserve immersion as visible barriers would only be a constant reminder of just how little space we actually have to work with in some games. They keep games as scenic and vast as possible, encouraging the player to explore more and ultimately get more out of the game. However, do not mistake this as an appeal to forgive all invisible walls, as they should only be used by developers as a last resort. In games like Batman: Arkham City, when players exit the appropriate area of the game, they are given a cinematic of their character returning back to where they should be. Another example can be found in Grand Theft Auto: San Andreas, where your warrant level would immediately go to high the moment the player went around a barrier into a restricted area and would not return to normal until the player exited the area. The risk that comes with going against the game’s intended pattern is not worth the reward, especially in the RPG genre. Environments should be designed to have as many natural barriers as possible to keep players within the environment. A bad example of invisible wall use can be found in Zelda: Twilight Princess, where the player must meet a certain requirement before they can gain access to a cave. Large, beastly guards stand at either side of the cave’s open mouth, but what is it that blocks Link’s entry? An invisible wall. An invisible wall that has no business being there. 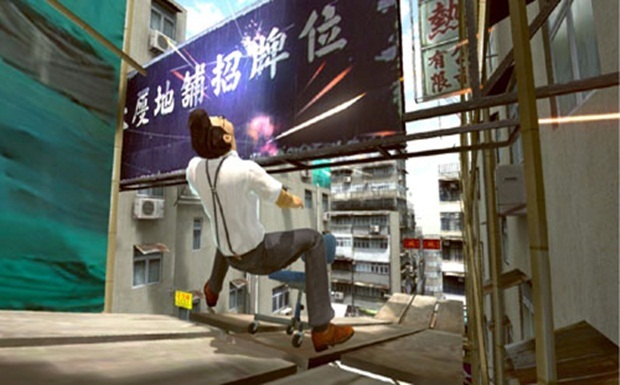 It is in situations like these that shows examples of lazy game developing, where the invisible wall could easily be replaced by a visible physical barrier without detracting from the game’s scenery. Come on, how hard would it have been to add an invincible door? Another common complaint is when a player needs a key to get through a specific door but can’t, even when carrying a weapon that can break the door. You’re carrying an axe and wail on the door that is obviously made of wood and vulnerable to axe thrashings, yet it remains unscathed. Panting, your thumb cramping from hitting the “attack” button a few too many times, you curse the world of video games and its seemingly indestructible doors. But why have this limitation that only serves to remind us of the restrictions of the world in which we are operating? Why can’t we break down doors if we so choose and have free exploration as we could with an axe in a real office building? Again, it comes down to preserving the entertainment value of the game. As an avid fan of the survival horror genre, I have had more than my share of encounters with solving over complicated puzzles to achieve a simple task like opening a door. However, these puzzles are all part of the fun of the game. Solving the clues to get the key makes you explore the area in greater detail, reveals plot points, and creates a bigger and better gaming experience. If doors within games were all easily destroyed, there would be much less exploration and the experience would be little beyond walking and killing. However, there would also be another consequence. Think of the pointless rooms with doors and windows we constantly see lining the hallways of the games we explore. They serve no purpose to the plot or any goals within the game, they are merely there for decoration as we make our way through top-secret military bases or bio-weaponry labs; they’re something to spice up the endless grey walls and blood splatter. If all windows and doors were breakable, if would be very easy to get into these rooms and look around. But that would also be very distracting. Since not all rooms can serve a purpose and some must be for decoration in order to make the game’s set seem more realistic, these rooms would do nothing but distract the player from their objective and take up time. Imagine the frustration of looking for a healing item or ammunition, searching a dozen rooms, and still coming up completely empty handed. In the Silent Hill series, developers even let the players know which closed doors are important. When trying to open a barred door, one of two messages will come up: one saying the door is “locked”; another saying the door is “jammed.” This distinction is made so that players immediately know which doors are significant and will be able to be opened at a later time (the “locked” doors) and which doors are merely decoration (the “jammed” doors). When it comes down to it, invincible doors enhance gameplay more than they detract from it. In the end, that is what it all boils down to; elements like invisible walls and invincible doors and windows bring more to gaming than they take away from it. When we encounter them, for that brief moment, the illusion is broken and we are frustrated. However, they are preventing a constant break in immersion that would be necessary without their presence. The virtual worlds in which we explore would also be more bland and less aesthetically pleasing without these little detractors. The next time you come across an article or a forum post denouncing these apparent failures in video game development, ask yourself if they’re really problems at all.